This is welcome news, because these characters have been discussing the destruction of Rose Cottage for weeks and weeks; it’s a pivotal moment in the story that I can’t wait for them to pivot to. “Possibly Sebastian,” he answers, as the other one hundred percent of the world asks, In what way? I mean, there’s no reason to expect that Sebastian has anything to contribute; he’s not an exorcist, or a firefighter. He’s an astrologer who’s deliberately given Elizabeth the wrong horoscope for reasons that I’m starting to suspect we may never know; he also went on a date with Maggie, and he has a weird relationship with his co-worker Roxanne. Those are all the things that we know about Sebastian. So why would his name even come up, at such an urgent moment? He looks into her eyes, and he kisses her hand, and they do as much smoldering as they can muster, which is great but as far as I recall this is their third conversation and they don’t actually have anything to do with each other. She has no connection to the problems that he’s been attending to, and they had to invent a false crisis to even get them in the same room together. 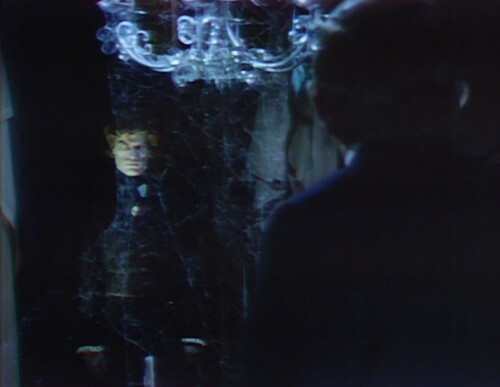 Anyway, Barnabas leaves a message for Sebastian that he’s going to Rose Cottage, and then he rushes back to Collinwood to tell Julia that Sebastian wasn’t home, which is stop-press news somehow. 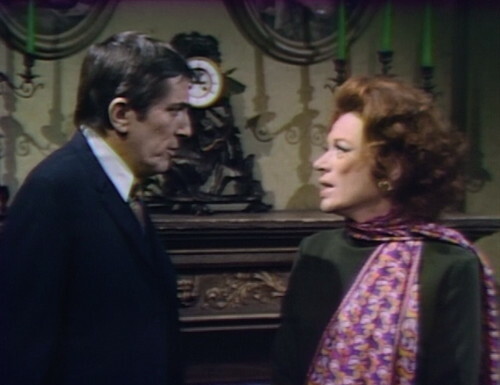 There will be no further information about what Barnabas actually expects Sebastian to do if he ever shows up at Rose Cottage, which he doesn’t. But who needs plot logic, when you’ve got a creepy music box? Barnabas arrives at Rose Cottage, which is still intact, but give it a minute to warm up. The place is deserted and silent, except for the carousel from the playroom, which is spinning and playing the storyline’s ominous theme song. “The carousel!” Barnabas exclaims, in thinks. “It wasn’t in this room when I was here before. Why is it here now?” That’s a good question, which the show does not intend to answer. 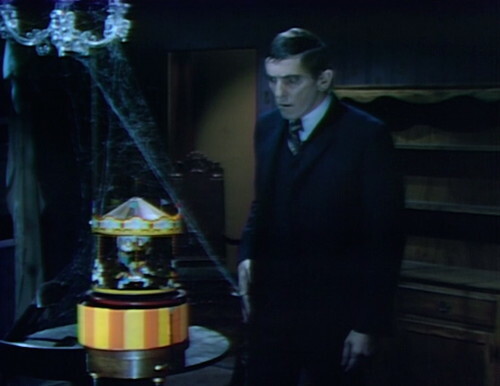 Barnabas decides that the evil ghost mastermind must have brought it to lure the children here, although there’s no evidence for that, and it’s unclear how that would even work. But that’s just the opening act. Here comes the main event: the showdown between Barnabas Collins and Gerard Stiles. Obviously, this is tremendously exciting. 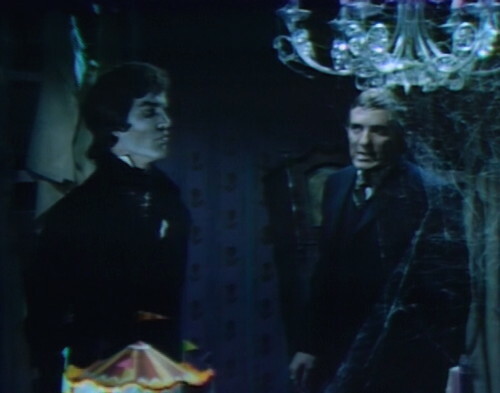 Barnabas is the show’s main character and protector of the Collins family, and Gerard is the evil spirit who’s destined to destroy Collinwood and all of its inhabitants. The last time these two faced each other, it was the final moments of the 1995 sequence, and Julia’s life hung in the balance. If not for Barnabas’ intervention, she would have stabbed herself, and become another victim of Gerard’s deadly machinations. But that was just the climax to their two-week 1995 adventure; this is the payoff for two months of story. This is gonna be good. He sees the ghost hesitate, and realizes that Gerard doesn’t know where the kids are either. “So much the better,” Barnabas declares, and then he strides toward the phantom menace, fire in his eyes. Gerard stands firm, apparently untouchable, as if even the combined power of Barnabas’ supernatural abilities and teen magazine fame is not enough to stay his hand. 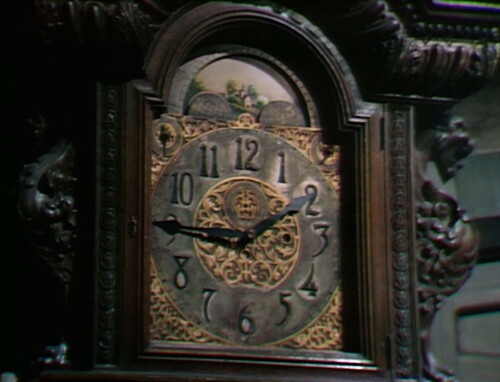 So that’s an incredible climax, one of the all-time best Dark Shadows cliffhangers — oh, except that it isn’t, it’s only the middle of act 3, and we fade to the Collinwood foyer, where the clock is chiming 9:10 for no apparent horological reason. That’s a bit of a waste, really, they could have made a lot more out of that moment, but at least we know that Barnabas and Gerard are squaring off in Rose Cottage for an epic battle that will determine the fate of the Collins family. Oh, except they aren’t, because Mrs. Johnson goes into the drawing room and now Gerard is here instead. So I guess Barnabas growled, “Unless you deal with me first!” and then Gerard excused himself and went off to mess with the housekeeper, leaving Barnabas standing around on his own, feeling silly. That is one of the strangest choices that I’ve ever seen on Dark Shadows, a television show made entirely of strange choices. They set up the most dramatic moment of the entire story — Barnabas confronting Gerard, standing in Rose Cottage on the night of its destined destruction — and then they fade to another scene that just casually negates the thrilling climax that they built. So that’s the moment, if anybody’s keeping track, when they officially break the ancient truce between author and audience. We have agreed to give them our time and attention, in exchange for a story that’s worth paying attention to, but this scene indicates that they don’t understand the story that they’re telling at all. If your lead character confronts the supervillain and it doesn’t mean anything, then what is this story actually about? They’ve got another six months left to run, but I’m calling it. Dark Shadows’ time of death: September 17th, 1970, at 4:16pm. Everything from here on is hospice care. And the really crazy thing is that that’s not even the only time in this episode that they blow a big scene. 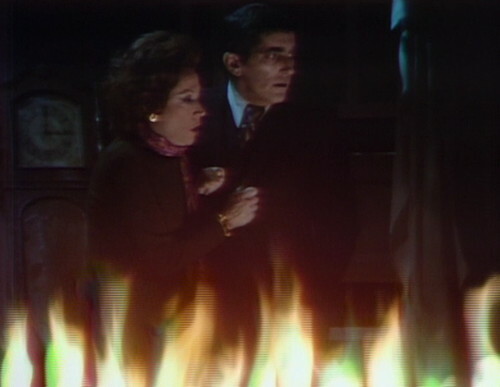 Gerard instructs Mrs. Johnson to go upstairs, and tell Julia that she had an ominous dream about Barnabas. Naturally, Julia rushes off to find him at Rose Cottage, which means they’re both on the scene when the door slams and the house bursts into flame. The villain has trapped them, and the destruction of Rose Cottage will be their destruction, too. And that would have made for a fantastic cliffhanger too, but it’s at that moment — just when we’re really starting to grasp the terrible challenge they face — that we hear somebody rattling the door handle, and the door opens, and guess what it’s Roxanne, and it’s still the middle of act 4. So it turns out this is actually a scene about Roxanne, who’s upset with Sebastian for some reason. And then Barnabas and Julia have to go back to Collinwood to check on Maggie and Mrs. Johnson, and they get there and Maggie isn’t there, and in the final scene, we see Maggie walking through the woods and approaching the dark-robed form of the random vampire who we don’t even know who it is yet, which is exactly the same cliffhanger as three episodes ago, except it’s outside. 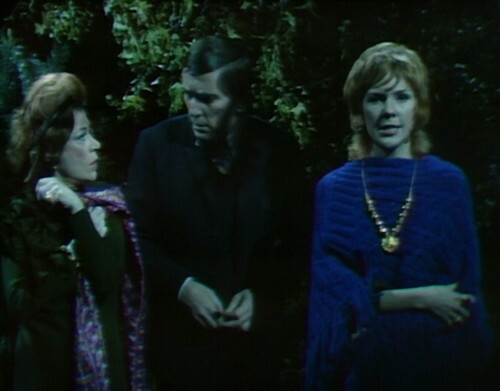 On Tuesday, Julia said that only Barnabas should watch over Maggie, because the vampire won’t have any power over him. 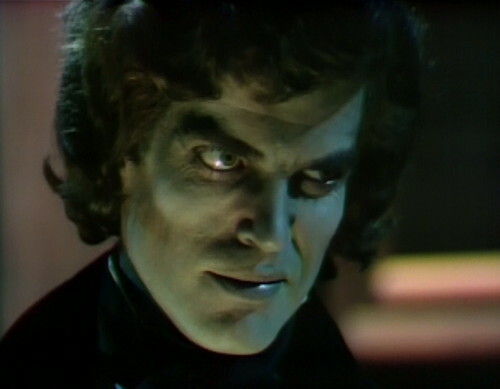 Today, Barnabas rushes out of Maggie’s room twice, leaving Julia to watch her. In act 1, as Barnabas is leaving Maggie’s room, someone in the studio coughs. Barnabas asks Roxanne to tell Sebastian, “I’ll be on Cumberland Road at Rose Cottage, just outside of Collinsport.” But nobody knew that “the old McGruder place” was called Rose Cottage until about five minutes ago, and Sebastian wouldn’t know it. 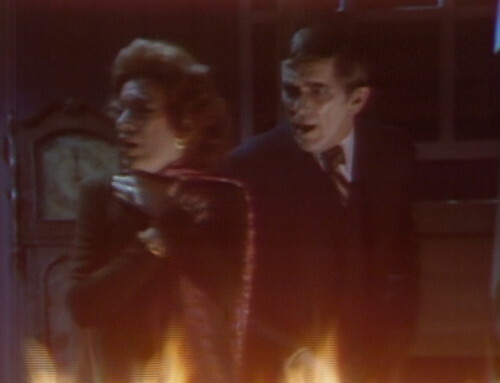 When Roxanne opens the door and saves Barnabas and Julia from the flames, she keeps a fixed smile while the music cue plays. Then she ducks away, just a second too early for the transition to the next scene. This is Clarice Blackburn’s last episode on the series, and it ends with Mrs. Johnson lying on the floor, unconscious — not a super dignified end. Blackburn appeared in 79 episodes, from September 1966 to September 1970. While she doesn’t return to the series, she plays Mrs. Castle in the movie sequel, Night of Dark Shadows. After Dark Shadows, Blackburn appeared on several soaps — The Secret Storm (1970), Where the Heart Is (1971-1973), One Life to Live (1973-1974), Somerset (1975-1976) and As the World Turns (1976-1978). She began writing episodes of As the World Turns as well, and eventually stopped acting and moved to writing full-time. She won two Emmy Awards for her work on All My Children, in 1985 and 1988. In a morbid coincidence, Blackburn died on August 5th, 1995 — two weeks after the fictional date of Mrs. Johnson’s death (July 23rd, 1995). Enjoyed all of Clarice Blackburn’s characters through the centuries on DS. May she rest in peace. Also, that photo of Gerard (above) with the green lighting or makeup on his face is quite scary! Yeah, but the shots of him in Rose Cottage look like Freddie Mercury, and not in a good way either. Clarice Blackburn was a terrific actress and DS made good use of her talents until the Leviathan era. I don’t know if Ms. Blackburn decided to focus on other projects (I faintly remember seeing her on THE SECRET STORM) or the writers foolishly ignored the character of Mrs. Johnson – at any rate, it was a real shame we saw her in only a handful of episodes in 1970. I always thought she would have been marvelous as Hannah Stokes in PT-1970 and also as Hortense Smiley in 1840. Blackburn had a substantial New York stage career in the mid-1950s, acting at major theaters like Circle in the Square; she won an Obie (an off-Broadway Tony) for a now-forgotten play; the stern critic Eric Bentley ranked her (in “The Dramatic Event”) with now-canonized stage royalty Geraldine Page and Maureen Stapleton. (Although Bentley probably didn’t mean that entirely as a compliment.) She seems to have made a determined transition from stage work to Golden Age television anthology dramas, and from there found work in numerous soaps–she got a lot of work over the years, and was obviously considered a reliable and competent pro. She brought her own brand of class to Dark Shadows. Why was Roxanne smiling when she saved Barnabas and Julia from the Rose Cottage inferno? Maybe she thought this was the end of it all. The later pic of Roxanne shows a woman who is quite miffed that there are six more months. She saw how weak they really are. Barnabas should easily escape, and open that door. What about your powers, hmmm? Nullified by fire. Sure, now it all makes sense. She wasn’t really smiling; it was just gas. 1840 is fun (mostly), Danny! Hang in there. I’m watching 1840 now and it’s great. Such a fun and unexpected change from the boring 1970 stuff that precedes it. When I first started collecting Dark Shadows on DVD, I did it piecemeal, just grabbing whatever second-hand copy was on the shelf in the record store. So I was picking up a lot of the 1840 period, and watching those mostly early on, well in advance of having finally collected the entire series to view all the way through. The 1840 stuff is pretty good. Whenever they do a past time travel story, they really capture the look and feel of the period — just like the best of the Hammer films. It has rich characterizations, great acting, intense drama, and interesting twists. On its own, 1840 holds up pretty well. It’s only when you watch the show in linear fashion, from beginning to end, that you become aware of drawbacks, the apparent downward spiral of the show and so on. That’s the only reason 1840 would suffer by comparison to 1795 and 1897. But if you just pick it up out of the blue, it’s just fine. 1840 is also more of a sequel to 1795 than to 1970/1995. Everything related to Gerard/Roxanne/Daphne makes more sense without having seen them in 1970/1995. If Barnabas had wound up in 1840 after 1897 or even after the Leviathans, there would be less of a sense of a steep decline for the series. As interesting as going to 1840 after 1897 seems, when viewing the series all the way through from start to finish I would always grow impatient with the time travel arcs, even 1795. Be it ever so crumbled, present-day Collinwood is the show’s “home base”. Maybe Julia could check the show’s “pulse beat” and give Danny a sedative. If Danny gets a sedative then we all get one. We’re all in this together. I do think the show struggled with having two male leads. They balanced this somewhat effectively in 1897 but seemed to never get it right when Quentin shows up in 1970. This is the nadir of that problem: Barnabas has little personal investment other than his unofficial role as “protector of the Collins family.” Quentin has the most personal stakes (his love for Daphne, his potential insanity) but he plays a mostly passive victim role. He spends more time as the stereotypical damsel in distress than the usual damsels the show used. DS was always playing around with the gender roles. That’s one of the things I love about it. Many longtime viewers had stopped watching by now and many of those who were still tuning in (like myself) had only started watching duing the high-ratings peak of 1897. Which meant that we had absolutely no clue who this Mrs. Johnson lady was, not in 1995 and certainly not here, her one token appearance during the summer of 1970 –apparently arranged by the casting department to justify her inclusion in 1995. True, Mrs. Johnson made one appearance during the Leviathan story but if you blinked you missed her. And I think she ended up on the floor in that epidemic too? Now that I’ve seen the whole series (several times) I can appreciate what a great character actress Blackburn was, especially her glory days of 1966-67 and the Quentin-Beth haunting. And if course her unforgettable Abigail and Minerva. On my Beginning watch I’m up to the episodes she debuts in. Abigail’s superstition but not so much you want her to suffer something horrible. I like Abigail more after experiencing her youthful pirate dalliance in ‘Blood and Fire’ – at least now i can understand the secret origin that turned her into such a spiteful old crone. I seem to recall reading that preliminarily the DS writers had written an 1840 role for Clarice Blackburn, just as Samantha Collins was originally written for KLS. I think Diana Millay would have made a much more interesting Samantha Collins. Curtis was talking to her around this time about a return and Samantha seems the right part. I can’t see her and Gerard as a couple, but it would be worth getting Lara and Diana together more. But Vestoff is just fine. I read once – and this is only hearsay – that Millay only wanted to play different incarnations of Laura Collins on DS. I think as fond as the DS writers were of recycling storylines on the series, even they probably realized another “Laura the Phoenix” go-round was just too repetitious. I’ve seen so many (incorrect) declarations of “Doctor Who died today!” on the DW boards this year, but Danny calling time of death on DS caught me unawares. As someone who enjoys both 1840 and 1841PT, i can only say that there are some decent death throes coming up in the post mortem period. We have some good Roxanne coming up to look forward to. And the show could have pivoted, bringing this great new character story to the forefront and save the show as the B-story which changes history again, and saves the audience from 1841pt. And Frid, not wanting to play vamp anymore, killed that chance, and sent us 1841, and the Lottery. But the show is still quite alive for now, so all take heart. There’s still good stuff coming. Overall, 1840 isn’t as good as 1795 or 1897 to me. However, there are some aspects of it that to me are actually better than anything 1795 or 1897 did. Looking forward to us being there. Probably one of the best compliments to an actor, is when one “only” appears in a certain amount of episodes (79 here), and the viewer could have sworn it HAD to have been more. Clarice Blackburn took a side character, had fun with it, and made it memorable. She will be missed when they don’t get their boiled dinners. They’ll be keeping body and soul together on brandy and storebought mayonnaise. How is Sebastian’s clairvoyant power supposed to help? I think that unless he has a fire extinguisher, he’s pretty much useless. Maybe even WITH. What they really want is the ever-so-groovy Halperin Collins from the comic book (see the entry for episode 1074 if you don’t remember) to scold Gerard and drive him off. Wait, we don’t even get a moment of Barnabas yelling, “Gerard! Where have you gone?” after the commercial break? Odd sort of wasted climax. I’m actually kinda surprised anybody’s remembered the 1995 story enough to throw Mrs. Johnson in here to be ensnared by Gerard! So, is Rose Cottage on fire, or not? The “flames” look as fakey as they did with Daphne, and there was no fire then. And does anyone else think Roxanne is being awfully “act-ey” in this episode? That “In my own way” bit was a big ole slab of ham. No, I don’t think B&J are going to succeed in saving Collinwood this time. And nobody in 1995 even mentioned Maggie and her vampire adventure, which is proving to be a real distraction. Well, better luck next time…bring in the pirates, let’s strike this set. Pretty big blooper in the end credits–Grayson Hall’s seems to have dropped off. Those ending credits were a source of problems, weren’t they? In time travel portions, they sometimes slipped in the “present day” characters. And a couple of times, they gave away a surprise. In this case, though, there’s just a long gap between Jonathan Frid and Clarice Blackburn, as if Grayson Hall’s credit fluttered to the floor and no one noticed. Even if they had noticed, I’m not sure anything could have been done. How exactly is a credit roll accomplished? I assume the placards are taped/attached to a roll, printed in white on a blue or clear background, then reeled while being ChromaKeyed into a shot of a set. Regarding the end credits, having associate directed live on tape game shows for many years, it is all in the timing. Depending on who did it on dark shadows, between the initial reading, the run through, and dress rehearsal, cuts would be made to get the show to time. They would start the show at 00:00 and it would have an out time of, say, 28:35. That’s top to bottom, including the commercials. The critical time would be the end of the final act. Let’s say the final act ended at 25:00 and the last commercial break was 2:02. That means they would come out of commercial for the credits at 27:02. Subtracting 27:02 from 28:35, that leaves 1:32 for the closing credits. The associate director knows how long the crawl is. (Starting with the producer credit and ending with the DCP logo.) It can also go at several speeds, each having a different time length, obviously. So let’s say at theoretical speed 2, the crawl is 1 minue. That leaves 1:32 minus 1 minute for the cast credits, or 32 seconds. If there were 5 cast members, they could spend about 6 seconds on each cast member’s credit. DS had several options for closing the show. What I described above is the longest ending. Next, they had the credits with the cast members, camera cards: Executive producer, Art Wallace, producer, director, writer, DCP logo. In later years, they also added camera cards for the associate producer and Cobert between the writer and the DCP logo. The next option was cast only, followed by DCP logo. The shortest would be just the DCP logo. The crawl would have been like a player piano roll, with white or yellowish lettering on a black background. The associate director would cue a stagehand who would flip a switch on the crawl machine and the credits would roll. Several mishaps could have (and did) happened here… the machine could be set at the wrong speed, the machine could malfunction and get stuck, the machine or the crawl could be slightly tilted. Also, say that Sam Hall was the writer on the “main crawl” but Gordon Russell wrote that day’s episode. They would literally tape Russell’s name over Hall’s. You can often see the Scotch tape marks. I am not 100% sure what mechanism they used for the cast member and short credits camera cards. I think they were in some sort of slide mechanism. I have one of Harriet Rohr’s marked timing scripts. This particular episode had the cast member/executive credits. She had written the word “slides” which is why I think this. By the time I started working in live on tape TV, all the graphics were electronically generated by a Chyron machine. Which made life a lot easier.